Manufacturing environments present a number of challenges for computer hardware including airborne particulate, vibration, extreme temperatures and a range of space constraints. Our industrial workstations, which feature our Hardshell Fanless Technology, protect internal components from environmental damage. 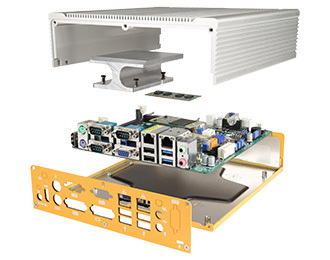 Thanks to their small size and flexible mounting options, Logic Supply workstation computers can be mounted out of the way or concealed beneath a work surface or on the back of a monitor, further protecting the hardware and conserving valuable work space.